Levi’s wants to make jeans more like yoga pants. Levi’s is facing its biggest crisis in years: athleisure attire. The denim brand says it has been challenged by the fashion trend of wearing exercise gear instead of jeans. The company’s profits fell 76 percent in the second quarter. In an attempt to revive popularity, Levi’s is trying to make pants feel more like those purchased from Lululemon or Under Armour, writes Kim Bhasin at the Huffington Post. “Today’s consumer is on a quest for casual comfort, whether it’s jeans or yoga pants,” James Curleigh, the president of the Levi’s brand, told HuffPo. The rate of growth in athletic apparel is soaring, even as American participation in sports declines, according to the Wall Street Journal. Barclays estimates that the market will increase 50 percent to more than $100 billion by 2020. 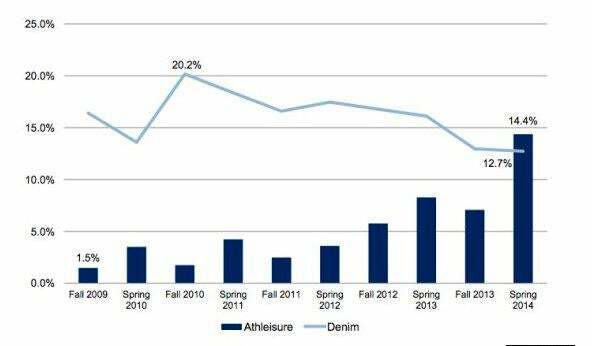 Meanwhile, denim sales fell 6 percent last year, according to NPD Group. The new athleisure trend is the latest chapter in Levi’s identity crisis. Levi Strauss reached its peak in the 1980s, but has struggled to reach that level of ubiquity sense. Another trend challenging the brand is men favoring tailored pants over denim, The Economist wrote in July.